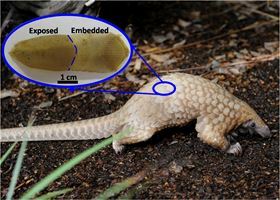 African Tree pangolin with an inset showing a keratinized scale. Arrows indicate the direction of growth. Scientists from the University of California, San Diego and ETH Zürich have studied an unusual mammal – the pangolin – to learn the secrets of its protective outer armor [Wang et al., Acta Biomaterialia (2016), doi.org/10.1016/j.actbio.2016.05.028]. When predators threaten pangolins, they roll up into a ball exposing hard, sharp-edged scales. These tough yet flexible scales are made of a hard nail-like material. For the first time, lead author Bin Wang along with Wen Yang, Vincent R. Sherman, and Marc A. Meyers have studied the structure of these scales in detail – from the nano- to the meso-level – using typical materials analysis techniques and microscopy to understand their unique mechanical properties. At the nano-level, the scales consist of layers of flattened cells protected by a fibrous protein called keratin. But unlike most other keratinous material, in the pangolin’s scales these layers or lamella are stacked in different orientations up to create a crossed structure. Along with crossed fibers, the scales contain a nanoscale suture-like structure that creates an interlocking interface between the lamellae. The complex, hierarchical structure makes it hard for cracks to propagate after an impact, resulting in a Young’s modulus of ~1 GPa and a tensile strength of 60-100 MPa. But the properties of the scales depend on how a strain or force is applied. When impacts are quick, the scales provide higher stiffness and strength, but also have the ability to absorb energy when strain is applied more slowly. The arrangement of the scales in an overlapping hexagonal pattern around a central scale also ensures that no part of the pangolin is exposed when it moves or curls up. The arrangement also enables scales to slide over each other, making the armor very flexible. The researchers don’t yet know whether their study will lead to new bio-inspired materials, but the combination of mechanical properties offered by pangolin scales could be exactly right for human body armor. A group of Canadian researchers have investigated the optimal design for lightweight armour, using 3D printing and mechanical testing.